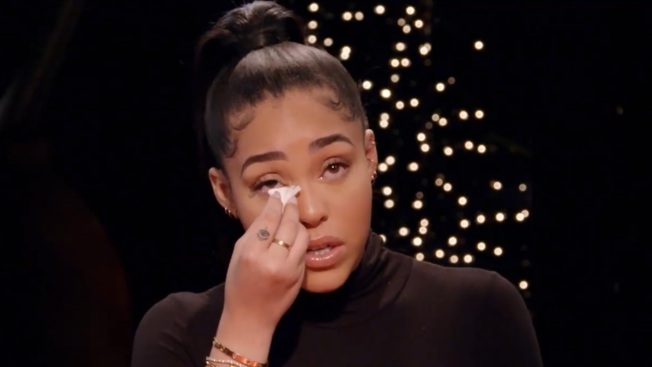 Jordyn Woods is speaking, but Khloe Kardashian isn't buying it. The 21-year-old model sat down with Jada Pinkett Smith for an episode of the actress' Facebook Watch show Red Table Talk, which premiered Friday. Over the course of the interview, Woods denied she had an intimate encounter with Tristan Thompson, who last week separated from Khloe Kardashian after rumors of a fling between the two of them. Woods says the incident started innocently enough when she joined a group of friends heading back to Thompson's house after an evening out last week. "I went to dinner with some friends and I went to this bar... there was a party going on. I was minding my own business, dancing, drinking. Tristan was there. He was doing his own thing. That was it. After the club, normal L.A. culture when you're young after the club, we all go to a house after. We're not thinking about who's house or where it's at. We're just having fun. It's in the moment." Woods says soon the small group that she was with said they were heading to Thompson's house. "I'm like cool. That's OK. It feels like a safe environment. I know him. He didn't even personally invite me there. It wasn't like 'Come see me.'" When they arrived at the house Woods says "We're all dancing. We're all drinking. And I'm not thinking I shouldn't be here. And that was my first mistake. And how would I feel if someone close to me is hanging at my ex's house or the father of my child. I didn't think about that. That's the first part of the problem. I should have gone home after the party. I shouldn't have been there." Woods admits as the night went on she and Thompson got more comfortable than they perhaps should have been, but says it didn't cross the line. "The night is going on and never once was I giving him a lapdance, making out with him, sitting all over him. It's just we're all together. We're all in a group. Never did we leave the public area to go to a bedroom, go to a bathroom. We're all in plain sight." She added, 'he didn't try to take me to a room. it was all just an innocent time." But later in the interview, Woods did confess the pair had exchanged a kiss at the end of the evening. "On the way out he did kiss me," Woods said. "No passion... he just kissed me. It was a kiss on the lips but there was no making out. And I don't think he's wrong either because I allowed myself to be in that position and when alcohol is involved people make dumb moves or get caught up in the moment." But minutes after the interview was posted Khloe Kardashian fired back on social media. "Why are you lying @jordynwoods ?? If you’re going to try and save yourself by going public, INSTEAD OF CALLING ME PRIVATELY TO APOLOGIZE FIRST, at least be HONEST about your story. BTW, You ARE the reason my family broke up!" she wrote. A few moments later Kardashian added another post including blame for the demise of her relationship to Thompson as well.